Physically removing a paying passenger from an overbooked flight is not good for the United brand, especially given that other passengers were capturing the whole incident on video, which can now be seen on YouTube. The correct response was not for the airline to claim it was right but instead to make things right. It would have been much better policy and far cheaper to continue to offer higher value flight vouchers until someone voluntarily gave up the last overbooked seat. And clearly it would have been better to do this before all of the passengers were assigned seats and comfortably boarded on the plane. 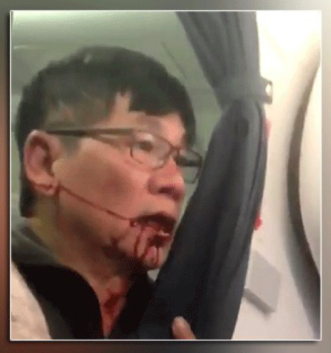 There are so many better ways to have handled this situation that it is surprising that physically removing a boarded passenger against his will was the chosen course of action. This seems to me to be a policy, customer service and PR issue. And this from the same airline that encountered a PR SNAFU a few weeks ago when it barred two girls from boarding a plane for wearing leggings. And of course, it is the same airline whose callous approach to a musician passenger whose guitar they broke led to the famous "United Breaks Guitars" video, viewed by almost seventeen million people. And, while almost ancient history now, it is the same airline whose flight attendants threatened a labor action labeled CHAOS (an acronym for "creating havoc in our system") during the airline's "United Rising" advertising campaign, which was intended to indicate a reemergence from an extended customer service slump. All I can say is, "United, you are not managing your brand well." People remember these things, and given options, will choose other airlines if they are able. Hire and train for legendary service, focus on employee satisfaction and up your crisis management game.